When you return items to a vendor you can choose one of the default reasons or create a custom reason. NOTE: The Admin - Inventory Setup user permission is required for this feature. See Configuring employee permissions. Re-order the reason selection list. Delete or rename a custom reason. You can create an unlimited number of custom reasons for Vendor Returns. From the main menu, click Inventory > Vendor Return Reasons. Click New Vendor Return Reason. Enter a descriptive name and a numeric value to order the reason in the Vendor Return Reason selection list. Lower numbered reasons appear before higher numbered ones. For example, 0 appears before 1. You can reorder the Vendor Return Reasons so that reasons appear in your desired order. Give a numeric value to each reason. Lower numbered reasons appear before higher numbered ones. For example, 0 appears before 1. Assign numbers for your Vendor Return Reasons. You can manage your custom reasons by deleting or renaming them. Deleted reasons no longer appear in the list of Vendor Return Reasons. You cannot delete or rename system default reasons. 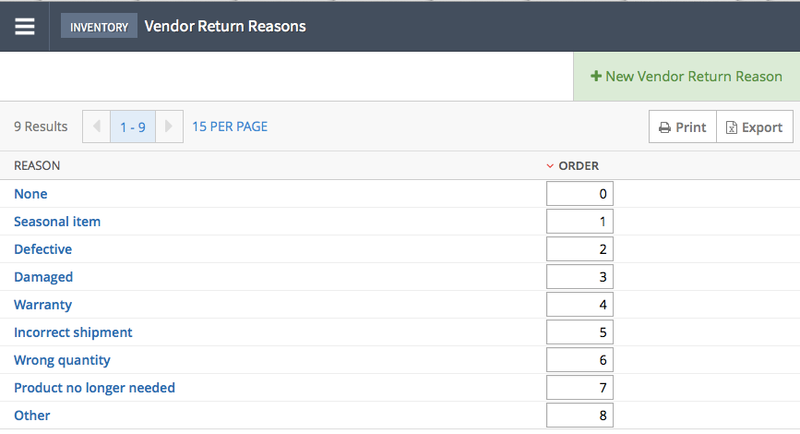 NOTE: If a custom reason was assigned to a Vendor Return, deleting or renaming the reason results in the Vendor Return order record displaying None in the reason field. From the list, select the reason you want to work with. Edit the name or click Delete to remove the reason. If you rename a reason, click Save Changes.